Hello there! 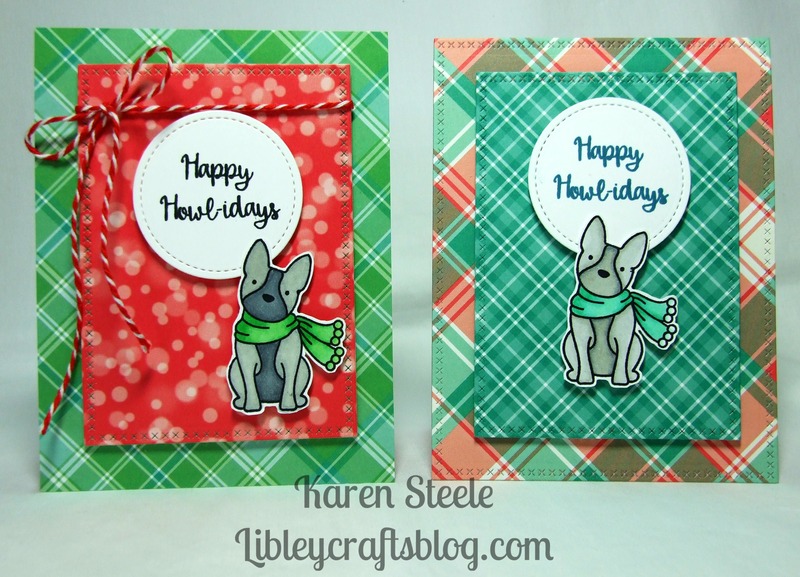 I hope you’re well and having a good week so far 🙂 Today I have some Christmas cards to share that I have made using this sweet doggy stamp from Avery Elle called – not surprisingly – ‘Happy Howl-idays’! These were really quick to make as I basically kept the design pretty much the same for most of them, changed the patterned papers around and coloured this little fella’s scarf accordingly to match! I also used: Papers by Lawn Fawn – Perfectly Plaid Christmas, Let’s Bokeh in the Snow and Perfectly Plaid. Die-namics Inside and Outside Diagnol Stitched Square die, Peekaboo Wonky Window die and lawn Fawn’s Stitched Circle die and Cross Stitched Rectangle die. Spectrum Noirs, Memento Tuxedo Black inkpad and various twine were also used. So adorable. I love how you have mixed the checks and patterns together – really punchy and effective! Oh, my!! Just too CUTE are those dogs!! And, love the pretty patterned papers!! They don’t look the same at all with these design variations, they’re super cute and what a great idea for mass production! These are soooo CUTE, Karen!!! I love all the different layouts and design! My fav is the wonky window!! Gorgeous work as always!! Great bunch of cards, Karen. Your DP mix and color choice looks great. The last one with the wonky square is my favorite !